Do we need badges for this? I'm a special case, I think: I have a badge, but I maintain it pretty well so it isn't stinking. 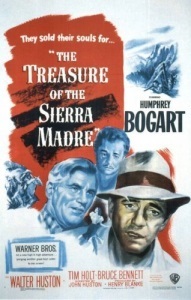 John Huston had a few misfires as director but when he was on, he was near the top. I'm still amazed that he managed to make such a bleak and hopeless film inside the hollywood system using one of their biggest start at the time. I'd never seen this before, and now I'm wondering if this is the origin of the "muttering to oneself while doing a task" trope. There were surprisingly few "seen it a million times" bits like I experience watching other influential classics, but I'm thinking the end was directly quoted in Rififi. Humphrey could sure rock a hangdog expression, and I think this is the most "actor-y" Bogart movie I've seen so far, the previous one being "In a Lonely Place." I tried to watch "African Queen" last week, but that one really seemed like I was going to feel like I'd seen it a million times before by the end.